Whatever faith you follow, there are hundreds of quotes that fit this time of year. Charles Dickens' words most touch me in the winter, here at Christmas time, but his words are universal in their meaning. Yesterday was the anniversary of the Sandy Hook tragedy. I continue to be alarmed that we are doing lockdowns with young children, and wonder what that does to them? Does it make them feel safe? Or does it make them more scared? I hope that we can all work together in the coming months to make change so that these tragedies stop. If you don't know it, Patricia McLachlan and Steven Kellogg created a beautiful picture book in memorial to those who died that day. 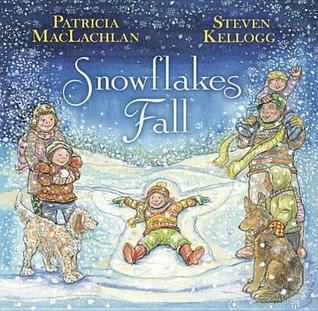 It is titled Snowflakes Fall. Kellogg lived in Sandy Hook and raised his children there. If this is your final week before winter break, I hope it's started well, and fills up with good things all week long, until you are on vacation! A friend of mine sent me that book. What a special gift and what a difficult issue. I can still shut my eyes and remember when we had special drills during the Cuban Blockade. So many of us wondered about our future. Now? Worse? I was older then, so remember a friend's boyfriend in the service & her being so worried about him. My family didn't worry about those things, so I didn't much either, rather a 'what will be, will be' attitude. Today feels different because of the schools and other places randomly targeted. I just hope the 'practice' doesn't affect the kids. Thanks Bonnie, the book is a special gift! I've never heard of this book. Thank you for sharing the title. My heart and prayers are with Sandy Hook daily as I make my way to my own school. Enjoy your last few weeks of December. Thanks, Maria. I too think of them, and other children gone. Big snow here today; all schools & many businesses are closed. I hope you find the book & see how special it is. Linda, Thank you for sharing the book and the moving post. You're welcome, Bernadette. It's important to make note of this day, but sad to do it. Thank you for this, Linda. I was not aware of Kellog's connection to Sandy Hook...so thanks for that, too. Thank you for the quote and the book recommendation. I'm home today. Schools closed due to a 'credible threat.' Nine hundred schools closed. We have some damage control to do when we return. Every bit of support is golden. Words need to create purpose and calm in times like these. We protect as best we can. But like you, I fear the long term effects on our littlest people. You're welcome, Julieanne. I did read the news about the LA schools, & wondered about you. To explain this to the younger ones must be a challenge & it's more than one conversation to be sure that those quieter ones will share too. Hugs to you in what should be a joyful week. <3 the book and the Dickens quote. I think this violence is different from the nuclear bomb drills that took place in the 60's, because today's kids have seen the news of other kids being victims. It's more personal in that way, and so, I would think, more scary. We have also gotten beyond the "it can't happen here" thinking, because it HAS happened in places where it would not be expected. Teachers themselves have been killed serving as human shields for their young charges, yet must lead without fear and without inciting fear in their students. Courage and well-being to all! I still wonder if we are ever really safe short of being locked in all the time, so still refuse to worry about it, just as I don't worry about having a car accident. 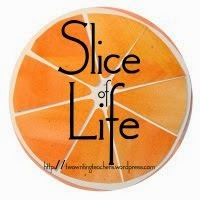 I do what I can to be safe & have done that taking care of my students, & now the grandchildren. I heard on Science Friday that so much $ was given in the early sixties to solve the problems of too many automobile deaths, so they worked hard & helped to alleviate that problem. Now, with so many deaths from gun violence, little is earmarked to help both in reality about guns and about the emotional toll to those survivors and/or victim's families and on. It saddens me that we cannot look at this problem with realistic eyes. Thanks Jane, I know that teachers are asked to do so much, and now this too. It is an extremely scary world in which we now live. I remember the drills of the 60's but we never had lock downs. Somehow I don't think the threats then scared us as much as the reality of what is happening today. It must feel scary for kids, and to have to talk about it, and so often. I had a hard time talking with the students, knowing I could not promise anything except that I, and the rest of the school, would do our best to keep them safe. It's heartbreaking what schools and families go through. I wasn't aware of this book. Thank you for sharing. Thank you Linda. Beautiful and important post. Like others, I was not familiar with the book. Am on the hunt for a copy now. I loved reading the interview also. From two of our favorite picture book artists, it was a good interview, I agree. Hope you love the book, Lisa. Thank you. Linda, I do love the book, Snowflakes Fall. The quote is so telling for this time of year. Thanks Carol. It is a lovely book.